Your new favorite breakfast! 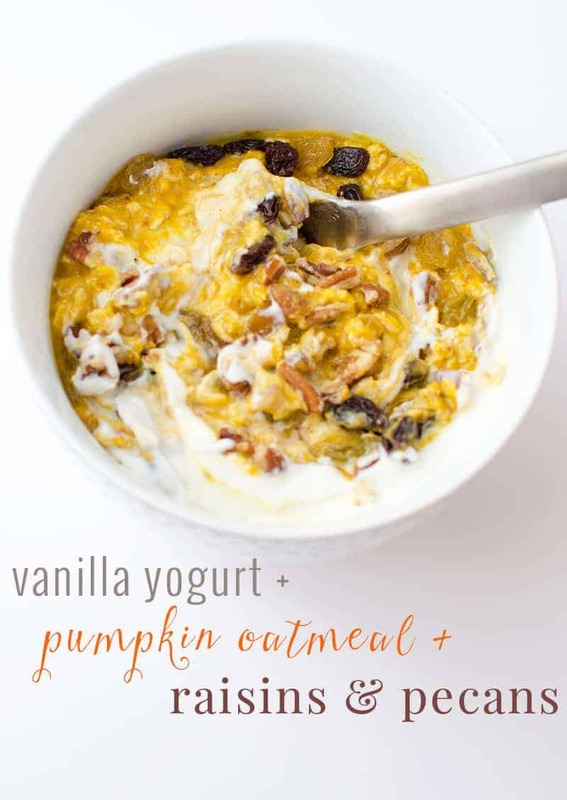 Layered grab-and-go breakfast of oatmeal, pumpkin, pecans, raisins and vanilla. Gluten-free and vegetarian with vegan option. Fall. Pumpkin. Butternut squash in everything. I actually bought a sweater yesterday afternoon while shopping- a sweater! It’s still 90 degrees mind you, but now that I’ve turned the page on September 21st, I’m embracing fall with open arms-that just happen to be covered in a gorgeous 30% off sweater. I held out as long as I could. It’s not that I don’t like fall; I do. But, I’m much more partial to summer. However, nothing eases me into autumn better than welcoming back a seasonal favorite, pumpkin. This pumpkin overnight oatmeal is my favorite way to wake up, especially now that mornings are a little darker and a tad cooler. While I still consider myself a morning person, I will trade sleep for breakfast almost every.single.time. Five more minutes in bed and settle for breakfast at the work cafeteria? Done and done. Overnight oats are so simply perfect, you don’t really even need a recipe. Layer rolled oats, pumpkin puree, vanilla almond milk, spices and flax seed. Shake in a mason jar and place in the fridge overnight. Enjoy as is or top with everything, like I do. 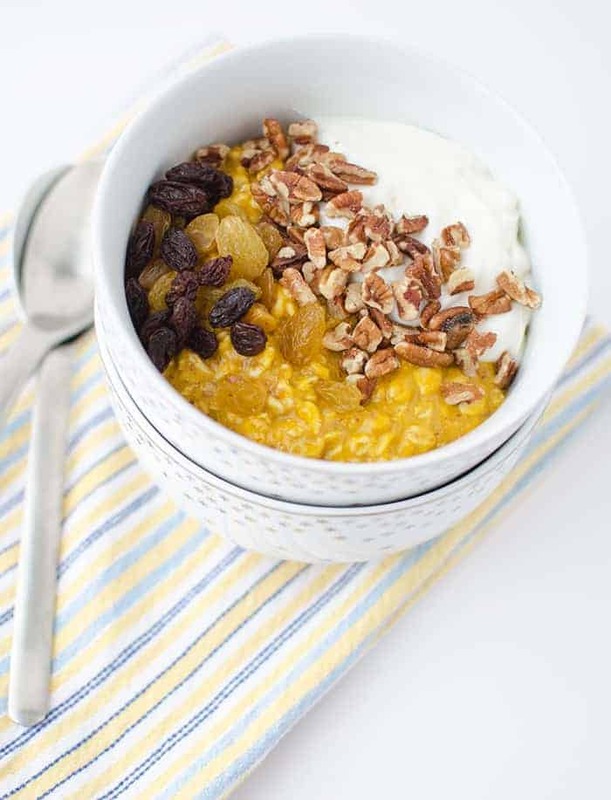 Texture overload with pecans, vanilla yogurt, and raisins. Sometimes I drizzle on almond butter, too. Trust me when I say that everything works here. Overnight oatmeal: Layer, Cover, Shake, Store, Eat. If you are looking for a healthy, nutrient packed breakfast —> this is it! Each bowl contains 329 calories, 7g fat, 9g fiber, 12g protein and a whole lotta vitamin A (129% DV) and iron (29% DV). My favorite fall breakfast! 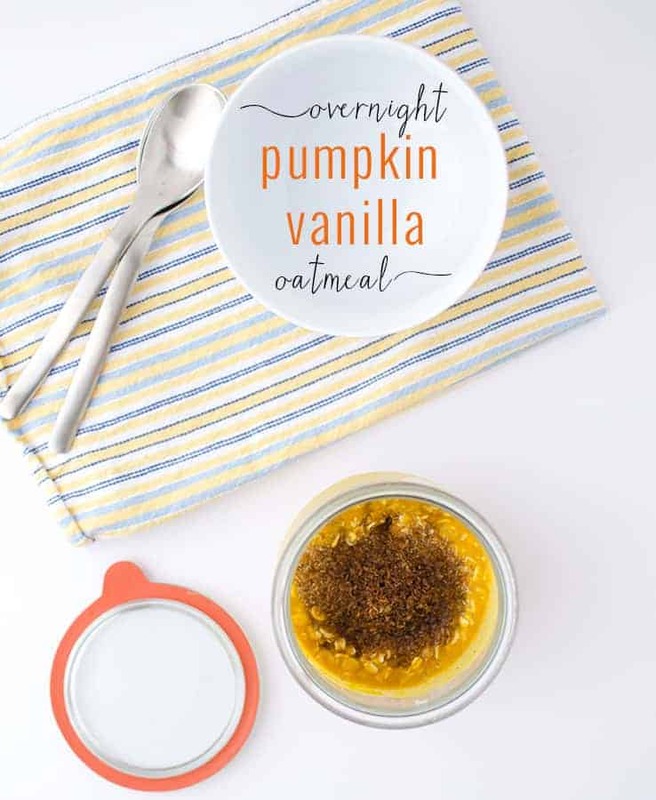 The easiest way to eat healthy in the morning- overnight Pumpkin Vanilla Oatmeal! Mix everything together in the evening and it’s good to go in the morning! In a mason jar, layer the oats, almond milk, pumpkin puree, flaxmeal, syrup, cinnamon and vanilla extract. Cover tightly and place in the refrigerator. Serve with chopped pecans and vanilla yogurt. Pumpkin + Vanilla = GiGi is a HAPPY GIRL!!!! I am not making oatmeal today BUT I am putting these two flavor profiles today when I stumble into my kitchen later – YUM! 🙂 I’m loving the flaxmeal addition! YAY! Can’t wait to stumble over and see what GIGI is cooking up!!! These pumpkin overnight oats look amazing! I hear ya on the 90-degree weather – hasn’t stopped me from buying sweaters, coats, or cute boots 😉 What I really want to know is, how do you do makeup in the car?? I must know your secret! It’s a skill! 😉 But, I don’t always look the cutest! ha! For one, it helps that my husband commutes with me. I usually persuade him to drive while I apply makeup, do my hair. My one tip is– always wait for a stoplight to do lipstick, mascara or eyeliner. I’ve learned that the hard way with many a mascara wands in places they shouldn’t be! Hooray for the return of pumpkin everything!! I love a quick, easy breakfast like oatmeal, but I’ve never really gotten on the overnight oats bandwagon. I’m just a little unsure about cold oats. Do you think these would work warmed up a bit too? Yes! It’s awesome heated up as well, I just eat it cold because I am lazy! Actually warm oatmeal and cold yogurt is amazing to me! But, Im a texture fiend! I’m so with you on the it’s 90 out but I’m ready for Fall foods and cloths, I don’t even care! I’m already through 3 cans of pumpki! Love overnight oats! Love the pecans with these flavors – yum! Ha! I’ve been looking at sweaters! Haven’t taken the plunge yet, but I’m sure it’ll happen soon. Got down to 55F last night! This looks absolutely YUM, Alex! Now that pumpkins are back in season I’m going to go with pumpkin everything, including oatmeal! Beautiful photo, it’s got me drooling! Can I get the carb count and sugar count for this recipe? Hi Barbara, per serving (including vanilla yogurt) is 27.5g carbohydrates, 10g sugar. To lower the sugar content, use unflavored yogurt.